This is a recipe that every cook should know. It is simple, quick, and almost universally popular. 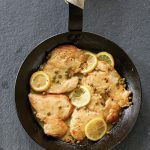 I leave the chicken in the pan while I make the pan sauce because I like the silky texture the flour-dredged cutlets develop when simmered in the lemony sauce. Some cooks prefer to cook the chicken through and transfer it to a platter before making the sauce and pouring it over the chicken so the crust remains slightly crisp. 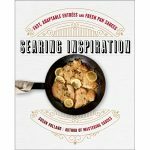 Excerpted from Searing Inspiration: Fast, Adaptable Entrées and Fresh Pan Sauces by Susan Volland, published by W. W. Norton & Company. © 2018 by Susan Volland. Photography © 2018 by Angie Norwood Browne. 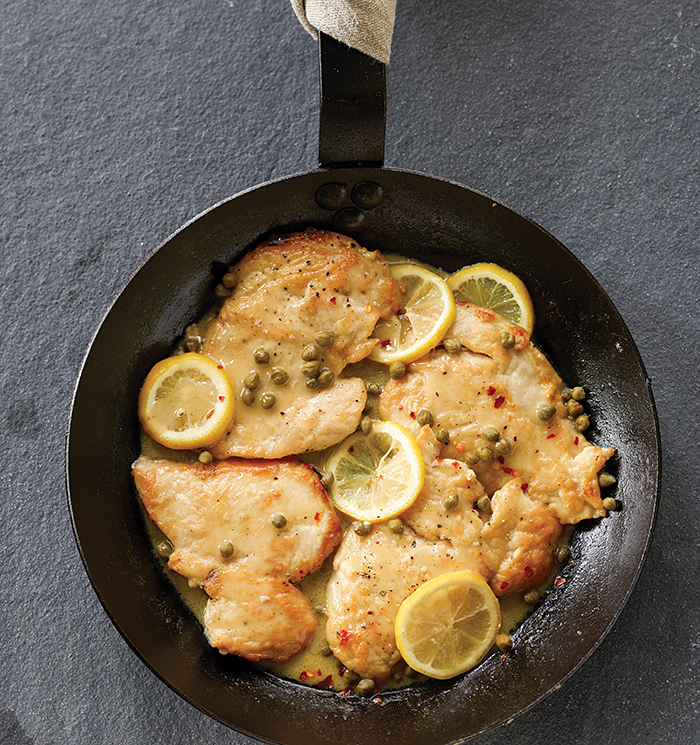 This sauce with this chicken piccata also goes well with: pork, turkey, or veal scaloppini; swordfish; and calamari steaks. Prep: Pat the chicken dry and season generously with salt and pepper. Dredge in the flour and pat off the excess. 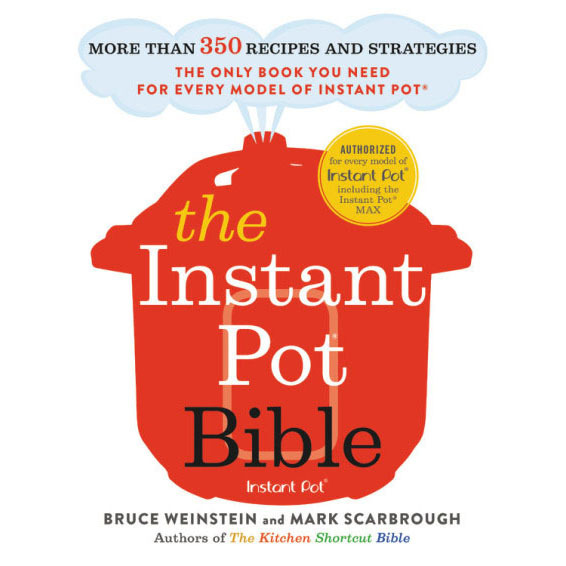 SEAR: Heat a large skillet over medium-high heat. When the pan is hot, swirl in enough oil to coat the bottom. Arrange the chicken pieces in the pan so they are evenly spaced. They should sizzle the moment they touch the hot oil. (If there is not enough room in the pan for all the pieces, cook them in batches, wiping the pan clean and starting with fresh oil as needed.) Brown the chicken on the first side, about 3 minutes, then flip, reduce the heat slightly, and brown on the other side; the chicken will not be cooked through at this point. If you have cooked the chicken in batches, return all of the pieces to the pan. SAUCE: Pour in the chicken stock and gently rub the pan residue with the chicken pieces to dissolve it into the sauce. Add the lemon slices, lemon juice, and chile flakes, if using, and simmer, flipping the pieces regularly, until they are just cooked through, about 4 minutes. Lift the chicken from the pan onto a clean platter or individual serving plates. Simmer to reduce the sauce until it is the consistency of gravy. Gradually stir in the cold butter, a few pieces at a time, until just melted. Finish the sauce with the chopped parsley and capers. Taste and adjust the salt and pepper as needed. The sauce is meant to be tart. Spoon the sauce over the chicken and serve immediately.